District Dinner is an opportunity for a night of fellowship and great food as we acknowledge and thank our adult volunteers for the hard work and dedication that made this year incredibly successful. Skyline District’s outstanding leaders at the unit and district levels will also be recognized. All volunteers in Skyline District are invited. The district committee is excited to announce a big change with the District Dinner. Inspired by the great success of the Dutch-oven Throwdown and to defray the rising costs associated with a catered meal, this year's event is going to be a covered-dish supper (potluck). The registration fee is $13.50 for the first person and $12 for each additional Scouter, adult, parent, and/or family member to cover the cost of awards. 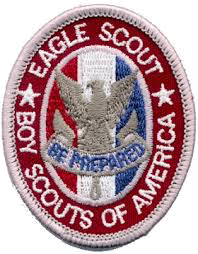 Eagle Scouts who have earned their Eagle Scout award within the last year are invited to attend the District Dinner free of charge. Payment is only made online with credit card, electronic check or PayPal. Council refund policy. Nominate Scouters who have served Skyline District youth above and beyond the call of duty. The Skyline District awards are presented each year at the District Dinner. District Award Nominations are due by Monday, January 8, 2019. Spark Award: This award is given to the energetic Scouter who gives that extra special “spark” in our district and adds to the quality of a unit or our overall district program. Family of the Year Award: This award is given to a family that best exemplifies commitment, service and teamwork in Scouting to help make our community better. Blume-Hardcastle-Hogue Award: This award is named after three distinguished Scouters who served this district. The award is presented to one unit in each Scouting program in the district. John Harrison Service Award: This award is for a unit that performs an outstanding act of service to the community. 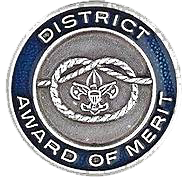 District Award of Merit: This is a council award presented by districts. The award is available to Scouters who render service of an outstanding nature at the district level. A nominee must be a registered Scouter who has rendered noteworthy service to youth in Scouting, outside Scouting, or both. The nature and value of noteworthy service to youth may consist of a single plan or decisions that contributed vitally to the lives of large numbers of youth or it may have been given to a small group over an extended period of time. Considerations must be given to the nominee's Scouting position and the corresponding opportunity to render outstanding service beyond the expectations of that Scouting position. The nominee's attitude toward and cooperation with the district, division, and/or council is to be taken into consideration. For questions, contact the Simone Brown at 346-777-2727.